Deloitte's financial services clients were most active at using the company's tip-off hotline to report alleged incidents of fraud at their companies in 2015, accounting for 76% of all fraud calls made using the hotline. The hotline, Deloitte Tip-offs Anonymous, is used by Deloitte's clients' employees to report fraudulent or other criminal behaviour at their firms. "This is a positive indication of the fact that employees in financial services are active in safeguarding best practice and are aware of what to do when witnessing irregular activities at their business," says Marius Alberts, Deloitte Western Cape leader. Of all the incidents of alleged fraud reported to the Deloitte hotline this year, 76% occurred in the financial services sector, compared to 10% in retail, followed by 8% in mining and energy. "The number of calls received illustrates the value of whistle blowing hotlines in both detecting white collar crime and acting as an effective deterrent against it. It is therefore crucial that company policy offers whistle blowers protection against possible reprisals," says Alberts. No less than 51% of callers to its fraud hotline chose to remain anonymous, while 13% opted to share their personal details for Deloitte Tip-offs Anonymous use only. The remaining 36% of callers gave permission to Deloitte Tip-offs Anonymous to fully disclose their identities in the submission of hotline reports. "While it is encouraging to see that so many whistle blowers felt obligated to report the crime, the fact that the majority of callers wanted to remain anonymous means that corporations should ensure that whistle blowers feel protected during the process," says Alberts. According to global statistics released by the Association of Certified Fraud Examiners (ACFE) in their 2014 Global Fraud Study, tip-offs appeared to a be a bigger source of detection for financial irregularity in organisations which had established hotlines, accounting for 51% of all detected cases compared to just 33.3% for organisations without existing hotlines. "Establishing a whistle blowing hotline in your organisation can be a very powerful and cost-effective safeguard against fraud and corruption," says Alberts. "It is also important that organisations create awareness programmes that enable employees to spot the red flags that help uncover fraudulent activity." ACFE statistics further revealed that organisations with hotlines were more likely to catch fraud. 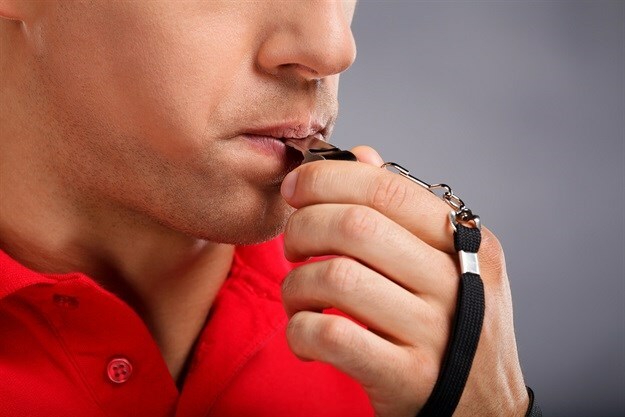 In addition, organisations with whistle blowing hotlines not only detected fraud 50% more quickly than those without such hotlines, but resulted in fraud being 41% less costly to the organisation. The 2014 ACFE Global Fraud Survey also found that internationally, tip-off hotlines were regarded as the best method of detecting irregularities, accounting for no less than 42.2% of detected instances of fraud in 2014. Banking was the biggest source of detected fraud cases in this study, accounting for 17.8% of all incidents versus 10.3% for government and public administration, 8.5% for manufacturing and 7.3% for healthcare. "In line with ACFE statistics, we also found that occupational fraud is prevalent in organisations, consuming an average of 5% of company revenue. This highlights the need for effective tools to combat such activity," concludes Alberts.